Halve the tomatoes and arrange on a baking sheet, cut side up. Brush with oil, scatter over the basil and season with salt and pepper. Bake for around 2½ hours until semi-dried.Increase the oven temperature to 200°C. Unroll the pastry and place on a baking sheet. Use a sharp knife to score a border 1cm from the edge of the pastry – be careful not to cut all the way through. Brush the border with beaten egg or milk and, using a fork, lightly prick the pastry within the border. Bake for 15 minutes.Remove the tray from the oven and press down the centre of the pastry. 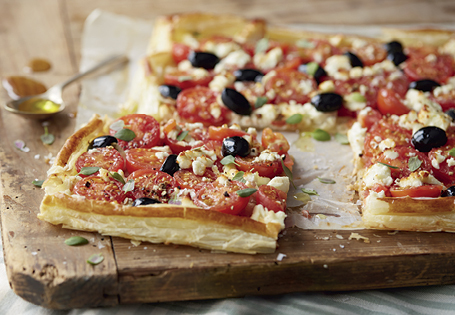 Scatter over the tomatoes and olives and then crumble over the feta cheese. Add a few good twists of black pepper and then bake for a further 20 minutes.